This giveaway is now CLOSED. Thanks so much to our wonderful sponsor Luxor Linens! We look forward to working with you again! The winner is 'bigguysmama' Remember: There are great giveaways active on the upper right hand side of the page! Even my inner frugalista allows me certain 'luxurious necessities'. I absolutely love high thread count sheets! That doesn't mean I don't do my homework to find the best possible quality at the best possible price. But the higher the thread count, the more I swoon. I like to make my bed an Oasis. And the more welcoming, inviting and comfortable it is, the happier I am. My grandmother was very discerning with her sheets, and I learned from her that good sheets, don't PILL, won't tear, and wash like new time and time again. And that's exactly what I've come to expect. I absolutely hate cheapo sheets that pill after coming out the wash! Luxor Linens is a leading provider of luxury linens to the finest hotels and homes worldwide. Their Boutique exhibits an exclusive collection of world-class luxury linens such as Egyptian cotton sheets, Egyptian cotton towels, Custom linens as well as home accessories for the bed, bath, and table. Richness you can see and feel. Exquisite detailing and expert finishing. Quality is always in the details, and every Luxor Linens product sets the standard for quality in materials and craftsmanship. Size counts! - Check the Measurements of BOTH your bed and the sheet set you are interested in, remember from manufacturer to manufacturer there are some differences in bed sizes, some beds are a little wider from brand to brand and others are longer, you need to know your exact size before you purchase your new sheets. What Feel Works For You? - Remember you will spend 8 hours per day or more on your sheets, feel counts. 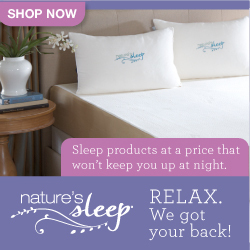 A great way to experiment with finding the feel that is right for you, is to purchase pillowcases in various types to see which one works best for you. Shrinkage - Many sheets will shrink as much as 7% in the first washing. That's why measuring is so important! Valentino, it was love at first sight! For those who desire the finest linens the world has to offer! This Italian import is pure elegance plain and simple. The Valentino collection is made from the finest 100% ELS (Extra Long Staple) Mercerized Egyptian cotton. Woven to a luxurious 1200 Thread Count the result is a feel that's cool, crisp, and heavenly soft. These sheets were featured on HGTV's "Home Rules" and for good reason! The sheets arrived in Luxor Linen's signature packaging, with a custom monogram! I chose my initials! I can't stress enough how much I love this sheet set, the egyptian cotton provides an un-rivaled level of comfort, they have washed quite well and while they are not my first set in the 1,000 thread count range, they are my first 1,200 and they are the first set to arrive in such lovely packaging! And the custom monogram makes a wonderful detail as a personalized, and very memorable gift! These sheets are certainly a great gift for anyone, anytime, but will definitely make a impression under the tree! And even that person on your list who has everything, will very much be pleased with this set! Ƹ̵̡Ӝ̵̨̄Ʒ - WIN IT! - Ascending Butterfly and our friends at Luxor Linens, want to you to experience this sheet set for yourself! ﻿﻿Don't you just ♥ Luxor Linens? I know I do! •Properly fits mattresses up to 19"
Ƹ̵̡Ӝ̵̨̄Ʒ - How to Win: (1) You must be a PUBLIC follower of Ascending Butterfly to be eligible for this and all giveaways. Indicate in your entry that you follow (if your 'comment name/user id' differs from your profile id, please let me know what name you follow under) and (2)MANDATORY entry- Visit Luxor Linens and link us to something you like! - Do NOT Post the URL to the Valentino Sheet Set as this was the review item. (3) You must also leave your email address somewhere in your comment. (You can format it this way for security, example: ascendingbutterfly AT mail host DOT com). (If your email is clearly visible in your profile, you can just say so, that's OK!) Please follow the easy 1, 2, 3 steps to winning (or in this case, the A,B,C’s of winning!) This giveaway is open to USA residents who are 18 years of age or older. No PO Boxes. Thanks to your enthusiastic response to this giveaway, the editors of Prizey.net made this an Editor's Pick, Thanks everyone! My favorite pre-Christmas ritual is attending the lights show a local zoo usually organizes at this time of the year. I follow @LuxorLinens on Twitter (@CKhalaj). 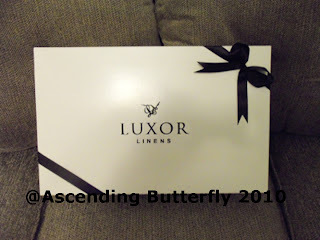 I "like" Luxor Linens on Facebook (catalina khalaj) and have told them you sent me. I entered your Satya Jewelry giveaway. Voted for your gift idea on Itsthoughtful (CKhalaj - vote 41). Night before Christmas was always spent eating crab and reading "The Gift of the Magi" when I used to celebrate. I entered Dream Tisha Set Giveaway. On Christmas Eve the whole family meets at our house to open presents. We have sandwiches, chips and dip, and desserts to eat. I follow Luxor Linens on Twitter. I am a follower. I like this item; http://www.luxorlinens.com/Fiorella-100-Fine-Ring-Spun-Cotton-Cherry-Blossom-Luxury-Towel-Sets-p-620.html. I follow via GFC and I like the Fiorella bath towels. My Christmas ritual is baking gingerbread cookies with the kids for Santa! Our Christmas eve ritual, I grew up catholic so Christmas eve always included Midnight Mass. at church and then a big feast, usually Chinese food, shrimp cocktail, champagne, so I continued the tradition with my family. I like the St. Tropez Spa 100% Egyptian cotton Bath Rug. I follow Luxor on twitter! I entered the Le Mystere giveaway. I follow you. I adore the Leonardo 1200tc Egyptian Cotton Stripe Luxury Duvet Cover in gold.! I would pick the color "Lake"
I follow your blog publicly via Google Friend Connect. I like this. After looking at the website for a long amount of time I decided the Leonardo 1200tc Egyptian Cotton Stripe Luxury Duvet Cover 1200 thread count duvet set with shams had to be the best things offered on the website. I am also a Public follower of yours. I like these cotton spa towels. gfc follower. Christmas fun bonus entry - We do all our gift exchanging on St. Nicholas' feast day, and preserve Christmas to celebrate Jesus' birthday... So Christmas Eve we work on baking a birthday cake, and telling the story. I also entered the Gold Cuff Bracelet Giveaway! Commented on your "Wordless Wednesday - Success" post! I'm a public follower..brkwalker and I really love the Spiaggia Ombre Luxury Beach Towels http://www.luxorlinens.com/Spiaggia-Ombre-Luxury-Beach-Towels-p-306.html ...My email is in my profile. Thanks for a wonderful chance to win!! The night before Christmas, we have a fun night of games and good food. The kids then go to bed and I set up Christmas. It's a cherished time! I follow you on Twitter @molomatic, thanks! Valentino Stripe 1200tc Egyptian Cotton Duvet Cover set in wine. I entered your Salux cloths giveaway too! On Xmas eve my hubby and daughter make cookies for Santa. Then we go to my parents for fondue. On the way home we enjoy the holiday lights and look for Santa! new years eve ritual....snuggle with a bed full of kids and watch tv together...usually its something like a marathon of America's funniest videos...and then watch the ball drop with whichever, if any, are still up at midnight! Oh, lots of snacking in bed too! I love these towels, especially in the bonsai green.